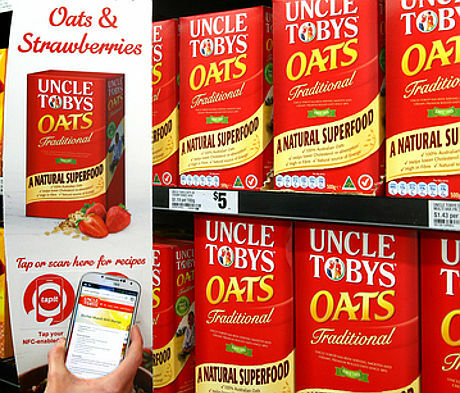 Shelf banners equipped with NFC tags have been placed in Woolworths supermarkets across Australia to promote food giant Nestle’s new Oats and Strawberries breakfast cereal. The campaign went live in 480 stores this week and was delivered by shopper and transit media network TorchMedia and mobile marketing specialist Tapit. “Shelf conversion is a challenge for the oats category, so we decided to amplify our campaign in Woolworths with a Tapit NFC-enabled aisle fin,” says Nestle’s Dean Carberry. “Offering recipes right in front of the product promotes impulse purchase, unlike television or radio where the message can be lost hours later,” adds TorchMedia’s Amie Hine.